***NOT A BIKE RACE**** There is an eating race, but definitely not a bike race. Yep, the rumors are true, Melburn Hurt are running an Alley Cat! But our Alley Cat, like everything we do, is a little different. Just like how every Alley Cat is different, thats part of the fun! What we can tell you is that you will need to be able to ride a bike and read a map. This game will see you traverse a beautiful suburb whilst uncovering the hidden gems you may never known were there. The emphasis on the afternoon is having fun. Ride whatever bike you have, wear whatever you like, spot prizes are on offer so get creative people! Organisers have a particular penchant for bright colours (hint). Expect to ride around 10kms, so be prepared with a spare tube in the event of getting a flat. The manifest will be provided to riders on the day. There is no course, you will need to be able to read a map or pair up with someone that can. 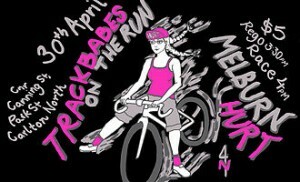 So get your mates together or come solo and have a whole heap of fun with other rad chicks. If you’re flying solo then let us know when you arrive so we can pair you up with other riders, coz riding is more fun when you do it with friends! Game will take about an hour, after which we will cruise the bike path to the afterparty at Two Row Bar in Collingwood. This is where we will be doing the presentation so be sure to follow us there!